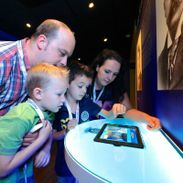 Especially for kids aged 4 to 8, there’s a new scavenger hunt at the Philips Museum. Kids will receive a blacklight and a treasure map and go looking for images in the museum that can’t be seen by others. At the end of the scavenger hunt the kids get to take a present from the treasure chest. €2.00 Costs: €2,- and the usual entrance ticket (kids until the age of 5 always get in for free).